The fourslide part-making process offers several benefits versus the traditional power press. Here's how to decide if and when to take advantage of it. 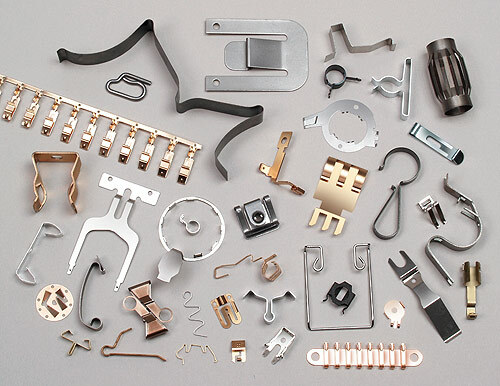 A sampling of parts that can be most economically produced by the Fourslide process. Click here to download this white paper (485k PDF). Named for the four tool slides that perform stamping and forming operations, the fourslide process offers several benefits over the traditional power press when it comes to making parts. Among its advantages: the cost-effective manufacturing of complicated forms, reduced production expenses, speedier product delivery and wide latitude to modify forms without a steep monetary penalty. Yet, just as you would never show up to a gunfight with a knife, neither can a process like fourslide excel within power press' proven milieu. The following considerations can help any engineer determine when to exercise this additional manufacturing option. When seeking to keep project costs in containment, obtaining parts from a source that employs the fourslide process makes sense. The means by which so much money can be saved is best illustrated from a cursory understanding of the process itself. Fourslide manufacturing begins with the raw material in flat strip form off a coil, which is stamped or blanked in the progressive die section of the fourslide machine. The strip is then fed into the forming section, where four tool-carrying slides approach the part from the four cardinal compass points, forming the material around a central tool or mandrel. The set-up of the machine cams determines the sequence, timing and number of tool strikes. Click here for an animated explanation of the fourslide process. Because the four forming tools are simply tool blocks carried by the slides, and forming is accomplished by the ability of the tools to approach from a variety of directions, these tools can be machined for a fraction of the cost of complicated power press dies that must include actuators within the tool itself to perform these forming functions. As a result, tooling for power presses can cost tens of thousands of dollars, while fourslide tooling typically runs just a fraction of that, making the fourslide tool more easily justified. "Given the current economy there is a little bit of uncertainty within the manufacturing community," says Anthony Viggiano, co-owner of Autotether, Inc. of Rocky Hill, Connecticut ? which makes a unique, multi-functional wireless alarm switch for boating safety applications. "People become reticent about spending a lot of money on a tool because the pay-back could extend to 10 years because of slow sales. But with the fourslide process, the cost of the tool isn't that great, so your up-front capital investment isn't high. A power press tool could cost $40-50,000, whereas with fourslide you're talking just $4-5,000." Such savings extend to material costs, as well. Since the fourslide process typically starts with material the width of the finished part, less material is wasted. "To me, that's what it's all about, getting good parts at the lowest cost," says Don Schmidt, a manufacturing engineer with Lexington, Kentucky-based Kaba Mas ? a leading manufacturer and supplier of high-security electronic locking solutions. "We have had situations where we've quoted a metal part with some forms, both from conventional stamping houses and from fourslide houses, and have always done better with fourslide in terms of cost." "I always look at the complexity of the part, and for complicated forms and spring-type parts it makes sense to utilize a fourslide operation," says Schmidt. Because of its unique integration of compound forming operations, the fourslide process can execute multiple bends, bends beyond 90 degrees, twists, cylindrical forms, and tapped and threaded holes before the part is ultimately ejected. This capability yields precision metal stampings, flat springs, wire forms, contacts and other complex forms for a wide range of medical, electrical, automotive, aerospace, military, consumer and industrial applications. "You can't bend a part beyond 90 degrees with an up-and-down power press, unless you add something resident within that tool that has actuating mechanisms," explains Jim Richards, director of marketing for Fourslide Spring and Stamping, Inc. – a Bristol, Connecticut-based, ISO 9001:2000-certified parts manufacturer. "With all the extra cams, lever arms and cylinders, a power press tool can become overly complicated, expensive, and more costly to maintain. On the other hand, the fourslide process can easily perform additional bends with the second, third, fourth or even a fifth slide, each of which is carrying a tool block." 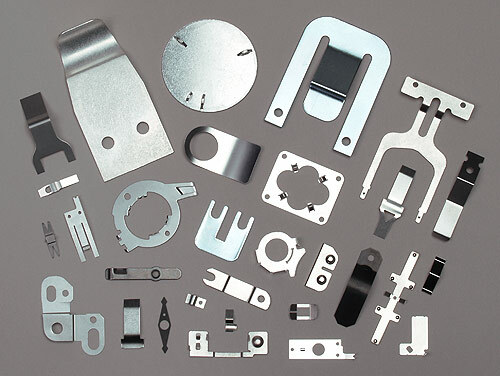 These are classic fourslide parts featuring multiple bends and complicated shapes that make other processes cost prohibitive, due largely to tooling costs. The simplicity in machining fourslide tools, versus the time-consuming complexity of power press tools, translates into a significant reduction of lead times approaching 50% or more. By the same token, the straightforward motion of fourslide tools simplifies laborious afterproduction adjustment often encountered with power press tools, further speeding the initial delivery of product. "If you look at it in terms of 'time is money,' waiting an extra month or two for a power press tool could really hurt," says Viggiano. "During that interval you might have sold $500,000 worth of product, so you actually lost a lot of money." Such false economy especially applies to manufacturers who seek shortcuts by going to offshore vendors for power press tools. "Our team looked at going offshore, but we found that for most of these countries, it is virtually impossible for them to 'get it right' the first time," continues Viggiano. "What will happen is that you will have to return the tool multiple times, and suddenly the lead time is the killer, stretching out to as much as year." If a product is readily subject to the changes of today's commercial market, changes in technology, or even the arbitrary demands of a specific customer, then the fourslide process definitely represents the best route for part manufacturing. The same rule applies when "first-article" runs don't come out as expected, and a part revision becomes necessary. "We had to make a revision, but it wasn't enough to get alarmed about; only around $1000," recalls Viggiano. "This is typical for fourslide tools. If that was a progressive die it would be more like $10,000." In contrast, the modification of a power press tool can turn into an extremely expensive process. In the case of a die, a whole new one may have to be built. But in a fourslide operation, part modification costs less because the tooling costs less. "With a progressive die or conventional stamping tool, you have only one cycle at the press, so all of your tooling has to be timed within the die in that one stroke – a change might require re-timing the entire tool," notes Don Schmidt. "Whereas, with four separate 'slides,' you can easily adjust each station individually. This gives you a lot more flexibility in controlling the different operations to effect any necessary changes." Capable of production rates of 15,000 pieces per hour – depending on part size and complexity – the fourslide process has been successfully employed to produce part runs numbering the tens of millions. While the "economies of scale" enabled by a power press and a die cannot be denied, the steep investment in the creation of the die must be taken into consideration. It can take millions of pieces, and years, to recoup the cost. Only the largest of manufacturers can suffer such long amortization periods. "Below the million mark, where many of us manufacturers reside, fourslide holds the advantage because of the very low cost of the tooling," points out Autotether's Viggiano. If your product only requires lightweight stamping, then no good reason exists to utilize a hulk-sized power press. As a general rule of thumb, any material less than 2" wide, less than 0.075" thick, and within 15" in blank length, can utilize the fourslide process. Blanking demands, as well as the hardness of the material, exert some influence on these figures. Of course, when it comes to heavy-duty jobs exceeding 25 tons overall, the advantage tilts back to the mightier power press. This article has appeared in several publications, including: Fabricating & Metalworking Online; Modern Application News E-Newsletter; American Tool, Die & Stamping News; and Tooling & Production E-Newsletter.